CRAZY DISCOUNT! Was: $319.95 Now: $209.96! Create an exploratory and secure space for your children to play and relax with this interactive playpen which is great for both indoor and outdoor use. The cute panels with activities will always keep your kids attracted and provide hours of pleasure inside the play center. 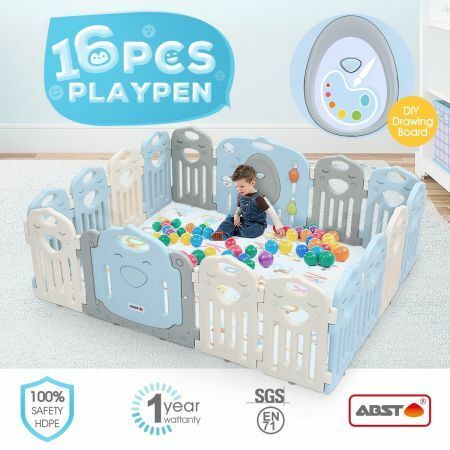 Manufactured from high quality and eco friendly PE material, this kids playpen is reliable and durable for kids ranging from six months to three years old to have an enjoyable moment. Featuring safety gate with TPR suction cups, the baby playpen ensures maximum security for your little curious youngsters. With totally 20 panels, the plastic playpen allows you to design into any shape you want, such as square, rectangular, making it possible for kids to engage in various games. Note: The play mat is not included.